Firstly, I should say that there isn’t a Leuchtturm 1917 notebook in the cover pictured above, instead we have a Life Noble Note A5 notebook. (arnold.sheng); the Instagram page has a link to an online shop, which doesn’t seem to be puclicized anywhere else. 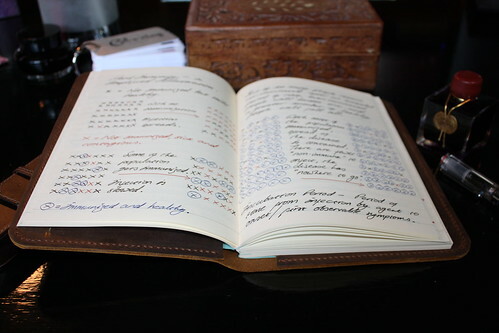 But it’s when you fit the leather cover to a notebook that you really appreciate how good it looks, and the quality of the product. The Noble Note A5 is not a large notebook, and the fact that it has soft, flexible front and rear covers, allows it to be comfortably slotted into the leather cover, and it fits well. 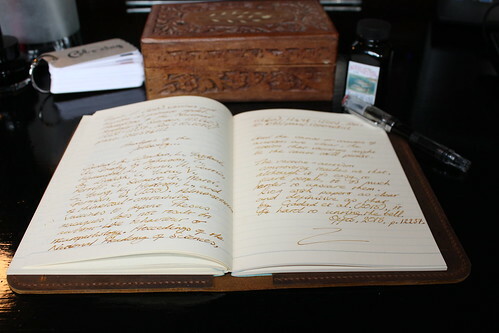 And the added weight even helped keep the Noble Note lying nicely flat on the desk. On its own, the cover is a sturdy piece of cow leather, with that slightly musky, new leather smell, and the soft, supple feel you would expect when the material is this new. It wears off quickly, and isn’t at all unpleasant while it lasts. It’s worth noting at this point, that hyperlinks to product pages on eBay don’t usually last long. Being an auction site, most products have a time period for which they go on sale, after which, the link expires and if the seller advertises again, then the products get a fresh web address (universal resource locator; URL). Which is a long-winded way of saying, if the cover’s URL has expired, don’t bother contacting me about it, have a look for the seller on eBay, and see if they’re selling any more. 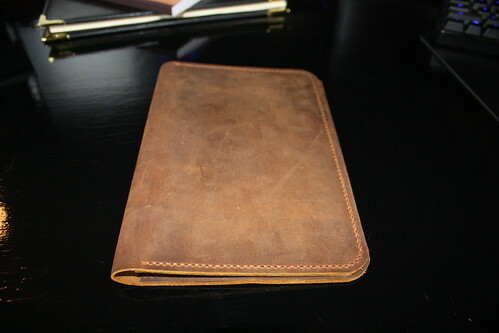 When I bought this cover, fashionyan2010 sold quite an extensive range of leather covers, for a great many items. 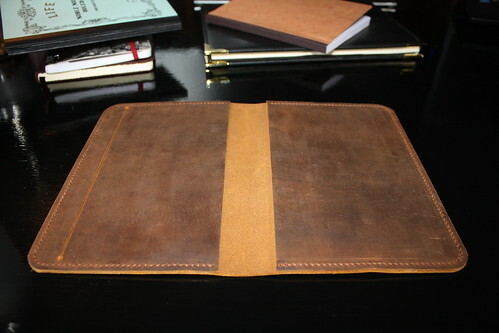 Update: Just prior to posting this review, I came across the DMLeatherStudio online store, and a direct link for this notebook cover. Also, if you order on this site (or any other), to make sure that the cover is a nice fit for an A5 journal, be certain to stipulate that you want the cover for the “Hardcover-249 Pages“. This fits both a Clairefontaine Age-Bag A5 notebook, with 96 pages, and a Life Stationery, Noble Note A5 notebook perfectly… or at least, it fits mine perfectly. 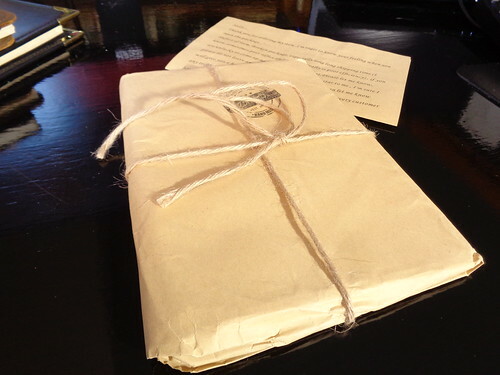 When you first open the cover out, the slit for an optional (and not included) elastic band, to hold the notebook and cover closed, is obvious on the right of the cover (what will be the inside back cover). As the description suggests, the rest is very basic; minimalist in fact. 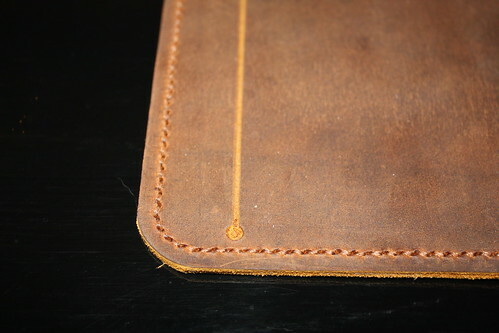 As you can see from the close-up of the inside cover, the handcrafted stitching is tight, uniform, and clearly finished with precision and care.. I won’t say here that this will fit any A5 notebook, but the Life Noble Note is a substantial notebook, and this fits into the cover very well indeed. 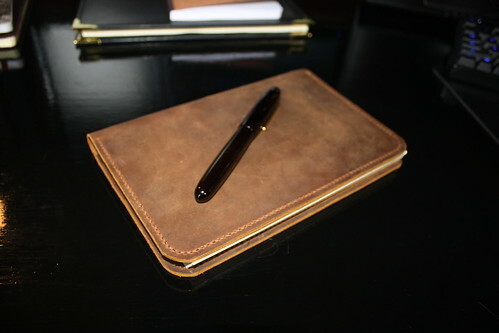 The picture below illustrates how comfortably the Clairefontaine Age-Bag Tan Notebook A5 also slots into the leather sleeve. The only drawbacks that I’ve found with this product aren’t visible in the pictures, or the eBay advertising. 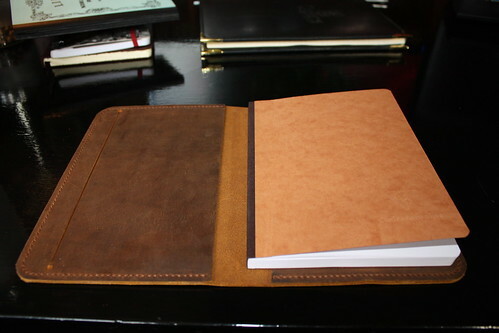 Firstly, because the product is handmade, there is variability in the size, but soft-cover notebooks allow for some adjustment to fit the leather sleeve, so that isn’t really an insurmountable problem. The second is delivery; delivery from China is pretty costly, and takes forever. When you think you’ve waited forever, and the thing will absolutely never arrive, wait about twice as long again, and it’ll probably turn up one day as a bit of a surprise—just don’t expect the delivery tracking reference number, or the web site, to have anything informative to say on the subject. That may be a little bit of an exaggeration, but not much. my cover took about five weeks to arrive. Whilst this isn’t the seller’s fault per se, it’s still worth considering. This is an attractive, tough, precision-made product, that will look better with age and use, for a price that is vastly reduced in comparison to similar products, available from retailers in the United States and Canada. 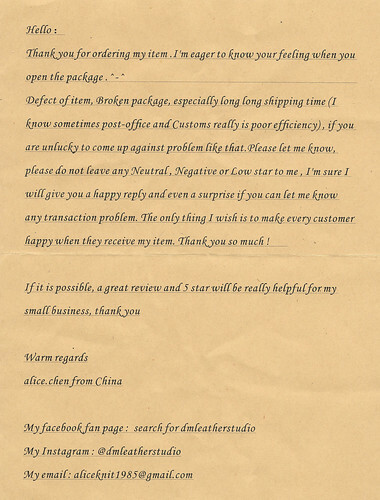 Even when you take into account the vagaries and expense of delivery from China. I’ll be watching this seller very carefully in future, and deliveries from China may well become an occasional surprise around here.